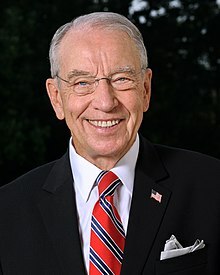 Charles Ernest "Chuck" Grassley (born September 17, 1933) is the senior U.S. Senator from Iowa and 91st Senate President pro tempore. He has been Senator since 1981. He was also in the United States House of Representatives from 1975 to 1981. Before that he was in the Iowa state legislature from 1959 to 1974. In January 2019, Grassley became the most senior Republican serving in the United States Senate due to the retirement of Orrin Hatch and the resignation of Thad Cochran. After the Republicans kept control of the Senate in the 2018 elections, Grassley became the 91st Senate President pro tempore. ↑ "Grassley, Charles Ernest". Office of Art and Archives and Office of the Historian, The United States Congress. Retrieved September 25, 2013. ↑ "Charles Grassley". Retrieved September 25, 2013. ↑ Hook, Janet; Hughes, Siobhan (2 January 2018). "Sen. Orrin Hatch Announces He Will Retire at End of Term" – via www.wsj.com.